I had to set up a regression and network performance lab. This lab will be managed by a Jenkins, but the first step is to understand how to boot a FreeBSD disk by PXE. This article explains a simple way of doing it. For information, all these steps were done using 2 PC Engines APU2 (upgraded with latest BIOS for iPXE support), so it's a headless (serial port only, this can be IPMI SoL with different hardware) . Notice in my lab, the server is configured with IP 1.1.1.254 and the DHCP range will be between .1 and .10. # Avoid "My unqualified host name (poudriere-image) unknown; sleeping for retry"
We will move these files later. 220 apu2.cochard.me FTP server (Version 6.00LS) ready. 150 Opening BINARY mode data connection for 'image.txz' (257213124 bytes). using 4 cylinder groups of 512.03MB, 16385 blks, 65664 inodes. newfs: Cannot retrieve operator gid, using gid 0. My mediacenter was, since some years now, a Raspberry Pi with OpenElec. But more and more of available contents are using HEVC (H.265) video codecs, then not supported on this platform. I was looking for a same size factor replacement with HEVC support, then I've started to test the Pine64 but was very disappointed by the poor support of its graphic drivers under Linux (only a very slow Android image was able to decode HEVC on this board). Hopefully I've found a good candidate into LibreElec (an OpenElec fork)'s list of supported hardware: HardKernel Odroid C2. Restoring LibreElec configurations from the USB key: all my network shares, database, settings were restored. And now I can enjoy to play HEVC movies downloaded from YGGTorrent. I've got a very specific needs: Selecting a firewalls to be installed between large number of monitoring servers and a big network (about one million of equipment). This mean lot's of short SNMP (UDP based) flows: I need a firewall able to manage 4 millions state table entries but don't need important throughput (few gigabit per second is enough). I'm not looking for such big throughput, then how about performance vs maximum number of firewall states on a simple x86 servers ? 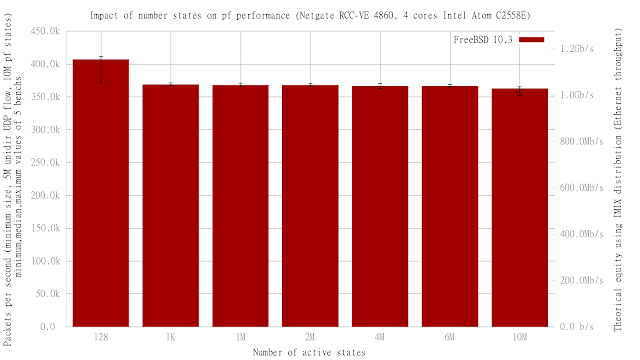 I will do my benches on a small Netgate RCC-VE 4860 (4 cores ATOM C2558, 8GB RAM) under FreeBSD 10.3: I'm rebooting it between each bench, and do a lot's of bench, then I need an equipment with a short POST BIOS time. My performance unit will be the packet-per-second with smallest-size packet (64 bytes Ethernet frame size) generated at maximum line-rate (1.48Mpps if Gigabit interface, 14.8Mpps if 10 Gigabit interface). This mean it manages 10K session maximum with a size of pf states hashsize of 32768 (no idea of the unit). I will start by benching pf performance impact regarding number of states: between 128 to 9800. 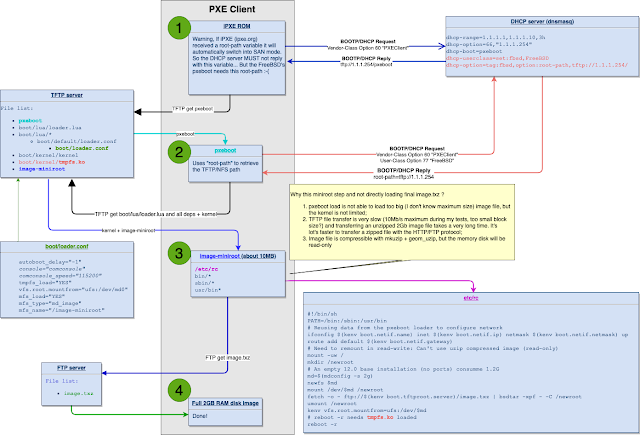 For one unidirectional UDP flow pf will create 2 session entries (one for each direction). As example, with a a packet generator like netmap's pkg-gen, we can ask for generating a range of 70 sources IP addresses and 70 destinations addresses: This will give total of 70*70=4900 unidirectional UDP flows (for 9800 pf states). We notice a little performance impact when we reach the default 10K state table: From 413Kpps with 128 states in-used, it lower to 372Kpps. Can we prevent this by tuning the pf.state_hashsize value ? This value configure the table size used to store state hash and this value should be a power of 2. I didn't found how to check the efficient usage of this table, but I've found the relationship of this table size and the RAM consumed. 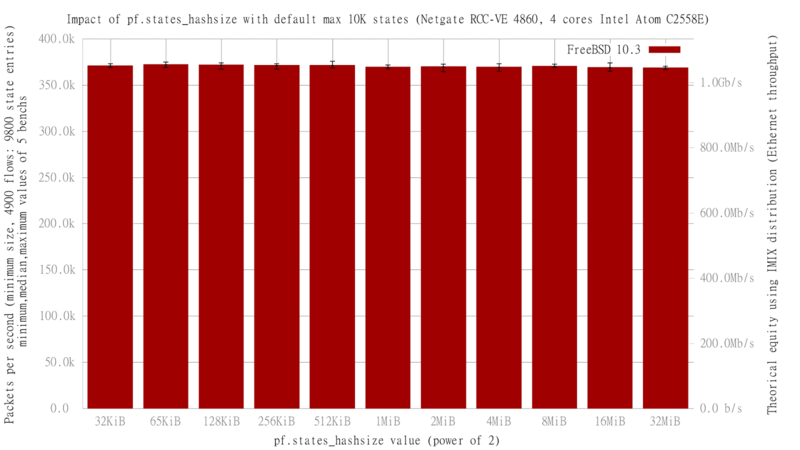 pf_hash consume 655680KiB of RAM: It's about 80 times the state_hashsize. We will try again with the next power-of-2 value: 16777216. 16777216 * 80 = 1342177280 (about 1,310,720KiB or 1.25GiB RAM). Great: We've got the relationship between pf.states_hashsize and RAM consumed. But take care: On this 8GB RAM server, the maximum hashsize is 33,554,432 (2.5GB of RAM). If configured to 67,108,864, this mean using 5GB of RAM on my 8GB server: this hang kldoal pf.ko (PR: 209475). There is no need to increase pf.states_hashsize with 10k state entries, the default size is enough. We just have to write down that with a 10K state table full, this equipment is still able to keept 372Kpps. What about the performance drop if we increase a lot's more the pf state table ? ( 5 * 256 + 134 ) source addresses * (5 * 256 + 134 ) destination addresses = 1,996,569 one-direction flows (about 4M pf state). It should be logic to increase pf.states_hashsize too after increasing the maximum states: But what value to be set ? Does the relation ship between this 2 values linear ? This mean because the increase factor was 400 between the default maximum number of state (10K) and this new value (4M), should the pf.states_hashsize need to be multiplied by 400 too ? If the relationship between need to be linear, the best performance will be reacheable at 32768 * 400 = 13,107,200. But because we are using power of 2, this mean we need to reach between 8 or 16M pf.states_hashsize. I didn't find answer in the man page neither in code comments, then I will restart the same previous bench regarding different value of pf.states_hashsize, until I reach the maximum value allowed on this 8GB RAM server. 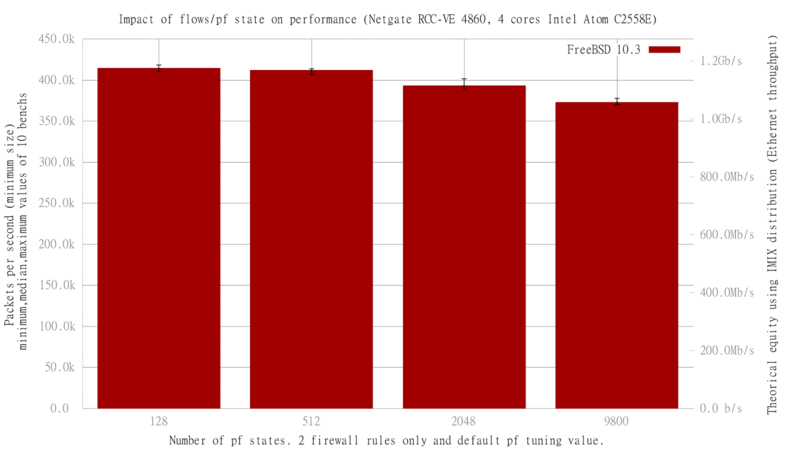 Theory seem confirmed: Best performance are when pf.states_hashsize reach 16M. There is only 12% performance penalty between pf 128 pf states and 4 million pf states. My 8GB RAM system can be configured for 32M of pf.states_hashsize, wich is about 1024 bigger than the default pf.states_hashsize. Then, can I configure pf for managing 1024 more state than default , this mean (10,000 * 1024) = 10M state entries ? With 10M state, pf performance lower to 362Kpps: Still only 12% lower performance than with only 128 states. After testing the behavior with only one firewalll, how about the behavior of pfsync with 10M states table to synchronize with another firewall ? During previous benches, the traffic was sent at gigabit line-rate traffic (1.48Mpps) and this heavy load prevent to entering command to this small firewall console. How will it share resources with pfsync ? But no pfsync traffic received on backup firewall, the DUT didn't have enough resources (all are spend to drop lot's of received 1.48Mpps rate) for managing correctly pfsync. Even small hardware can manage large number of sessions (it's a matter of RAM), but under too lot's of pressure pfsync will suffer.